We all know it: Email is king and here to stay. As the lifeblood of today’s business environment, it’s the standard for communication as enterprises increasingly engage in real-time sharing of information with internal and external constituents. And as emails continue to fly, data security concerns continue to rise as attachments get larger, organizations reach globally and mobile devices become the tool of choice and convenience for communication. To ease the email inundation, today we’re announcing new enhancements to the Syncplicity enterprise file sync and share solution, enabling organizations to further improve business efficiency, drive productivity and extend IT security and control with Syncplicity Secure Send and enterprise-grade mobile device management (MDM). At Syncplicity, our goal is to allow easy file sharing without relying on email attachments, while giving IT the security and control required to ensure compliance. It’s intuitive. With Syncplicity Shared Links, users can now send large files to internal and external recipients directly from their local machine with no extra steps. 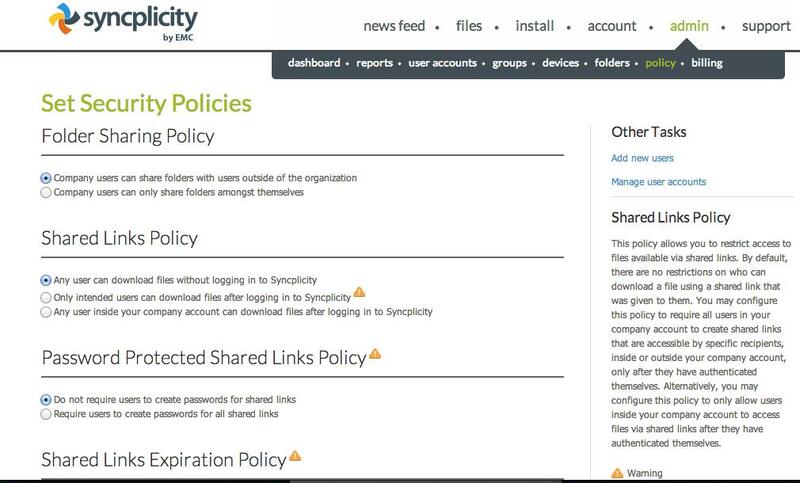 Simply right click on the file and Syncplicity will automatically generate a unique link with optional security features such as adding passwords, restricting access, and tracking downloads to ensure sensitive material is viewed in a timely manner and remains protected. For IT, this means administrators have more visibility into sharing with enterprise-wide password policies and expiration periods, and audit reporting. It’s now easier than ever to control content that exists in unmanaged locations like email attachments, local desktop folders and consumer cloud services. Organizations can also choose between secure cloud storage or on premise, providing ultimate flexibility in meeting enterprise data security and compliance requirements. Thanks to BYOD, organizations are seeking end-to-end protection of data that reside on mobile devices. Syncplicity for Good apps for iOS and Android extends Syncplicity mobile security capabilities, enabling users to take advantage of Good Dynamics’ enterprise-grade MDM features. This allows data to reside in a FIPS compliant container on the mobile device, and IT to enforce policies such as applying application passcodes, device restrictions, and file actions to an approved set of third party apps in the Good ecosystem. And if MDM and auditing features isn’t enough, Syncplicity now provides federated identity management through Active Directory integration with OneLogin and Ping Identity for single sign-on and automated user provisioning solutions. While organizations attempt to impose policies and file transfer tools such as FTP sites, enforcement of strict policies will only drive users to go rogue, resorting to uncontrolled, consumer file sharing services which causes more IT, business and regulatory issues. These latest enhancements demonstrate our commitment to providing the most complete and secure enterprise file sync and sharing solution that IT will trust, and users will love. Check out the demo and let us know what you think!